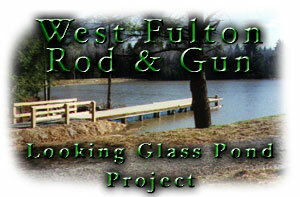 In 1995, the West Fulton Rod & Gun Club entered into an agreement with the New York State Department of Environmental Conservation to construct a 23-arce warm water fishing pond on Rossman Hill in the Town of Fulton. The pond is located at an old mill pond site on a 10,000-acre parcel of State Forest Lands. Now completed, the management and control of the pond are the responsibility of the State. During 1996 and 1997, the pond construction was underway. Through the fine cooperation of many groups, agencies, and individuals, along with a special gift of equipment, manpower, and expertise from Emil Galasso of Cobleskill Stone Products and a $25,000 grant from NYS Senator James L. Seward, the pond was completed and made available to the public in May of 1997. On May 24, 1997, with nearly 300 persons in attendance, a ceremony was held at the Looking Glass Pond facility. The pond was dedicated to the families who first settled Rossman Hill. Looking Glass Pond not only offers great fishing, but also a large parking area and a boat launch. The pond also is handicap accessible. Looking Glass Pond also offers a 2.1-mile foot mountain bike trail around the pond. The trail starts and ends at the parking area. The Long Path North Foot Trail also leads through the area, passing over the pond's dike. A complete trail map is available from the West Fulton Rod & Gun Club. This "Observation Deck" is located on the foot/bike trail at the 1-mile point of the 2.1-mile trail around Looking Glass Pond. It has been placed at the water's edge to offer a fine view of the birds and other pond wildlife. Since construction, both DEC and SUNY Cobleskill Fish & Wildlife students have been very active in monitoring the water quality and fisheries of the pond. On June 17, 1998, Stamford's DEC Fisheries Unit electro-shocked parts of the pond and examined many yearling bass as well as many golden shiner bait fish. The growth of the yearling bass was labled "exorbitant" for a hilltop pond by Fisheries Technician Fred Linhart. Yearling bass averaged 7.3 inches, and, with luck, Looking Glass Pond will offer very fine fishing in 1999.